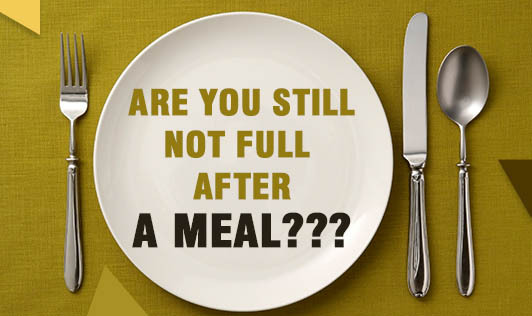 Are you still not full after a Meal??? Undoubtedly, we all eat to feel full, feel good and also satisfy our appetite and taste buds, but a few weight watchers, have this unique concern of not feeling full even after a meal. They obviously cannot go back and eat more, or feel good about the meal they just had at the cost of their weight! If you didn't know, feeling full or reaching satiety is a complex process involving both hormones and the brain. Just like it takes a few rings to reach someone on the telephone, your stomach needs anywhere between 10 to 45minutes to release cholecystokinin, a hormone to signal your brain that you are full. The release of this hormone and the interaction with the brain isn't instantaneous, and so if you are eating too quickly, your hormones may not be signaling that you are full. Indulging in mindful eating will make you feel full after a meal. When you eat, your stomach stretches because you are full. Enjoy what you are eating by using your taste buds and sense of smell as this will increase your feelings of satiety. Here is also one of the reasons why your Dietician asks you to include salads in your meal. Low calorie foods like salads are known to trigger hormones that leave you full along with stretching your stomach and making you eat more. This way, you are stuffing your stomach with low calorie beneficial salads and at the same time, keeping your calorie intake in check! So now that you have got a new way to cheat your stomach, why delay?